Flexible Attack Innovations, LLC (FlexAttack) is a unique fabrication company located about 40 miles northwest of Los Angeles, California. Formed in 2014, FlexAttack is the evolution of Flexible Alternatives, Inc., an industry leader and a “go-to” company for Specialty Flexitanks, custom fluid transportation and storage solutions and New Generation Aerial Firefighting, along with a wide array of specialized services. If you need to ship or store bulk liquid, give us a call. This company is an extension of myself and my family values. Our team has worked hard to build a rock solid reputation over the past two decades with our customers and industry; conducting business with professionalism, integrity, reliability and innovation. We have provided services to a wide array of customers from Fortune 500 companies to small start-ups, International Companies along with the United States Government, Foreign Governments and Militaries around the world. 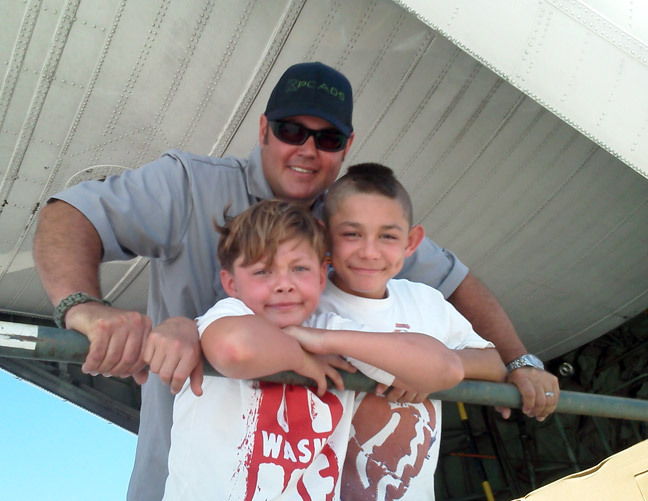 Ty Bonnar and his sons on the ramp of a C-130 during PCADS testing. I love what I do, this company is an extension of myself and my family values. Working for over 22 years in the industry I have always been interested “new” ideas and applications. Let’s be real here, everyone loves brilliant ideas but the problem is finding someone to design and build that idea into a real tangible product. This is where FlexAttack comes into play. For years, we have built innovative flexible products using Radio Frequency Welding, Metal Fabrication and Imagination. We love to take on challenging projects along with development of “new” products for a wide array of applications such as Bulk Liquid Containment, Water Conservation, Aerial & Ground Fire Fighting, Erosion Control and Innovative Shelter Solutions.